Fashionistas Daily .Com: Hey Girls! 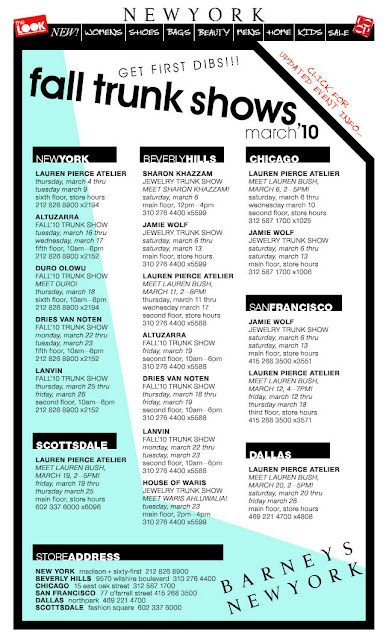 Barneys March & April Fall Trunk Show Schedules - It's Never Too Early To Start Shopping For Fall Winter 2010! Get Your First Dibs !! Hey Girls! Barneys March & April Fall Trunk Show Schedules - It's Never Too Early To Start Shopping For Fall Winter 2010! Get Your First Dibs !! My fellow fashionistas, as we all know Barneys New York (one of our favorite store for all luxe designer goods!) is having a jam packed trunk shows for the fall-winter 2010 collections! Click on the photo below to see a more larger size & clear photo of the schedules. Click below to check out Barneys New York's Creative Director Simon Doonan is up to?! This episode is all about Unique Gifts ! 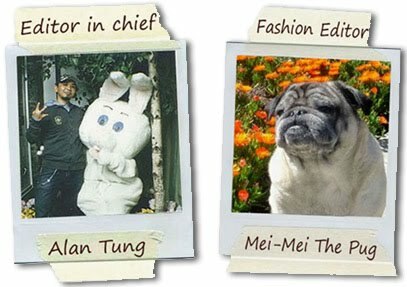 We love his creative visions for Barneys! It's never too early to be on the wait list for fab fall 2010 new designs! Check out the schedules below, grab your CHANEL bag and head to Barneys New York to get your first dibs !! Don't forget to come back to our blog and share with us what fab stuff you bought! Until next time, be well & look fabulous! !